Epoxy-based paint for bilge, bulkhead, and locker areas. High-solids formula provides excellent coverage, drying to a durable, hard finish unaffected by moisture, oils, acids, alkyds, and solvents. It won't stain, mildew, or lift. 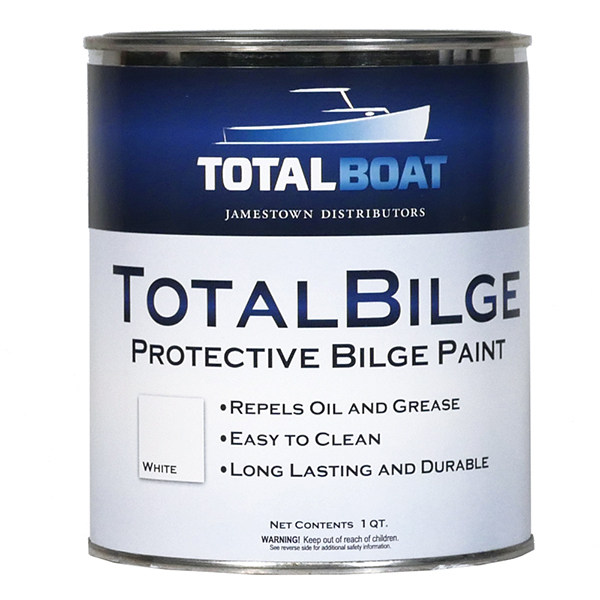 TotalBilge is the first and only epoxy-based bilge paint. There’s nothing else quite like it. TotalBilge adheres better, covers smoother, and dries faster, glossier, and harder than what you’re used to. The finish provides longer lasting protection in dirty, greasy, and mildew-prone places. The only thing it doesn’t do is cost more money. Paint TotalBilge on anything you want to protect and maintain easily: examples include you boat’s anchor lockers, compartments, lazarettes, beneath hatches, and inside engine rooms. We’ve even had a customer use it on the floor of a reptile enclosure. It adheres tenaciously to clean, dry, oil-free surfaces. A clean bilge spotlights problems like leaking antifreeze, fuel, and oil, so you can act before they become emergencies. 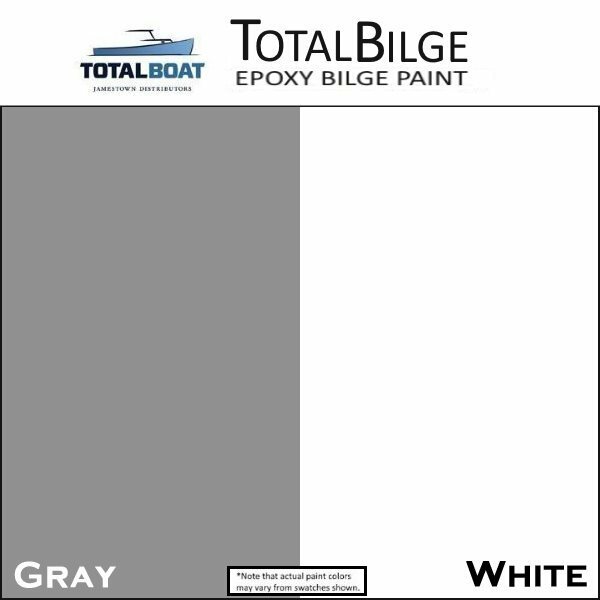 Choose a color that makes bilge issues stand out or disappear, depending on your preference. White makes everything easier to see and is just as easy to keep clean as the gray TotalBilge, which is the warmest, lightest shade of gray available. No matter which color you choose, your boat’s bilge will smell better and look cleaner. And, it’ll be a lot easier to keep it that way. 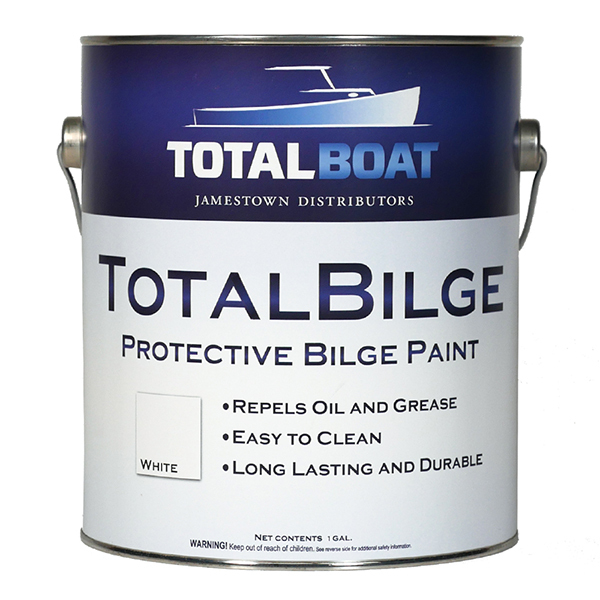 Thinning (Brush/Roll): TotalBilge should not need thinning if applied to fiberglass or primed surfaces. Use TotalBoat Special Brushing Thinner 100 as follows: 5-10% to increase flow in warm conditions; 1st coat on bare wood substrates should be thinned 10%. Coverage: One gallon covers 250-300 sq. ft.
Primer: TotalBoat TotalProtect—only mandatory on metals, but may be used on properly prepared wood or fiberglass, if desired.